It’s that time of year where we welcome warmer days and lots of outdoor fun. However, the arrival of the new season also heralds grey days with potentially damaging thunderstorms, more so for those living on the Highveld. While we can’t control the weather, it is important to be prepared for the stormy days that come with the season. Check the weather. This might seem like an obvious suggestion, but given the detailed weather data now available to us, there is less of an excuse to be caught unaware by a storm. If you know of a storm that’s about to hit, find a safe place to keep your car undercover. As a MiWay client, you get hail alert SMS’s that enable you to be better prepared for what Mother Nature has in store. Prepare your home. Obviously, moving your home out of a storm’s path is impossible, but, you can lessen the hit by gearing your home up to weather the storm. Before the storms get aggressive, make sure to clear your gutters of leaves, twigs and other debris, as overflowing gutters can lead to leaks and further damage. Do a full home inspection! Get your car insurance and home insurance cover right. The costs of repairing hail and storm damage can be enormous, so it’s important to check that your insurance policy has you covered. 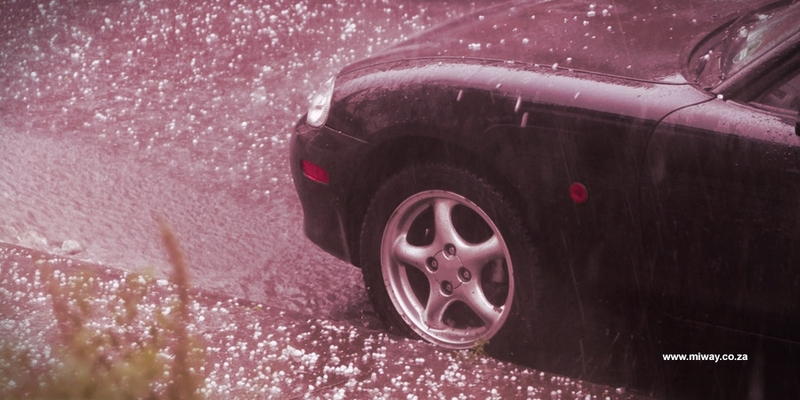 Hail and thunderstorms can cause massive damage not only to your car, but also to your home and its contents. Make sure you are covered against everything from dents and smashed windows to appliances destroyed by lightning strikes as well as power surges. Get your claim right. It is imperative that you lodge your claim as soon as possible, providing all relevant information about the damage incurred as accurately as possible. Photographic evidence is always helpful in these instances, as it will help your insurer to settle your claim sooner. As a MiWay client, if you are unfortunate enough to be the victim of storm damage this season, there are a few easy ways to speed up the claims process; another way we’re going out of our way to enable you to live your way. Get an obligation-free insurance quote today and start living your way!